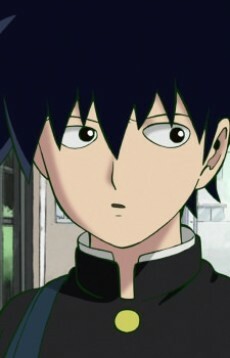 Ritsu is very clever and serves on the student council. He excels in academics and everything else he tries, but none of that matters to him as much as psychic power. Before he awoke his own psychic powers, he longed for the esper abilities his brother has always had and was frustrated by his own inability to do things like bend spoons. He may have a habit of carrying spoons around with him, for bending purposes. He is a perfectionist with a not-so-hidden dark side. Unlike Mob, he finds it okay to use psychic violence against people when necessary. His brother is more important to him than anyone or anything else. He is apparently serious but can be quite jumpy at times.